Have you ever seen anything so perfect? 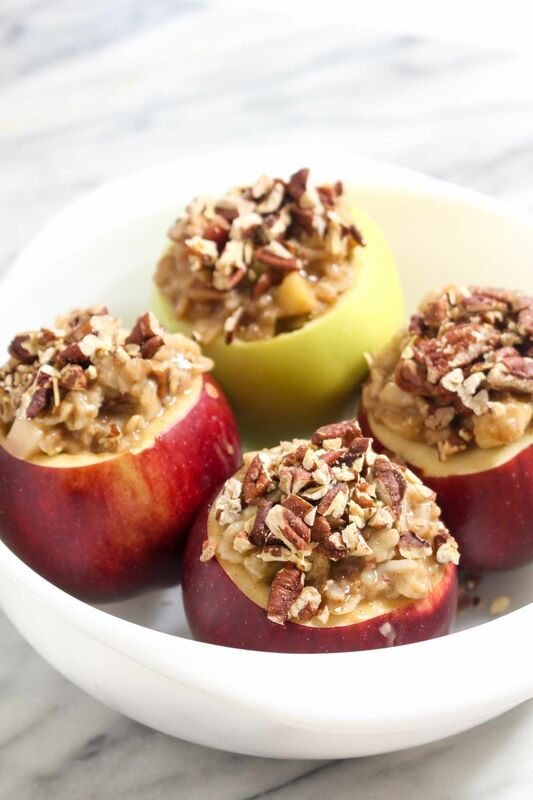 These apples are filled with maple sweetened cinnamon oatmeal, topped with pecans, and then baked until the apples are tender and the oatmeal filling has set up. 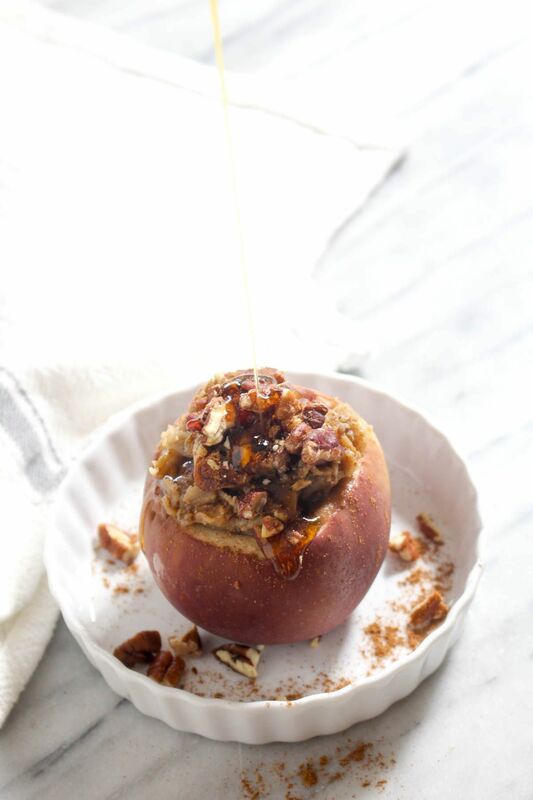 They are an entire perfect brunch dish tucked inside their perfect apple jackets just waiting to be drizzled with maple syrup and eaten in approximately ten seconds because they are just so delicious. It is recipes like these that make me want to stay inside all day wearing my fuzzy socks and sipping tea, then probably most likely 100 percent munching on one (or two… three?) 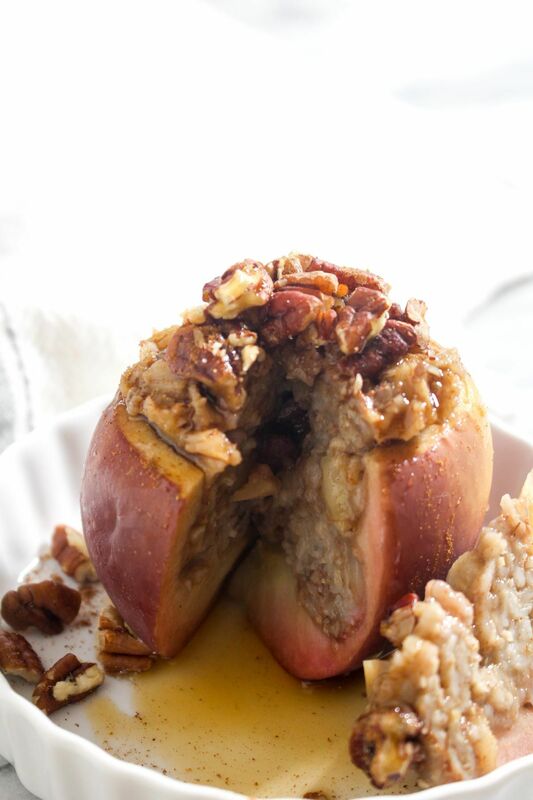 of these oatmeal stuffed apples while snuggled in front of a crackling fire. 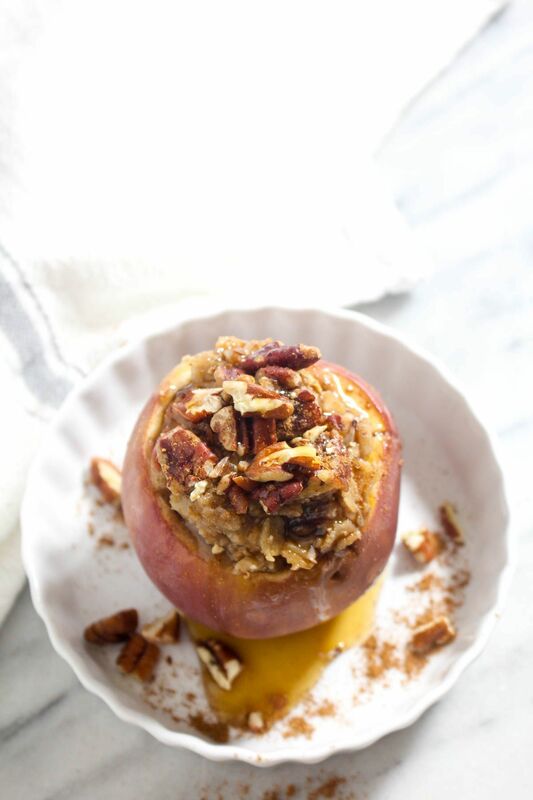 The real beauty of these apples is that they are both decadent enough to be a dessert, and healthy enough to be breakfast. 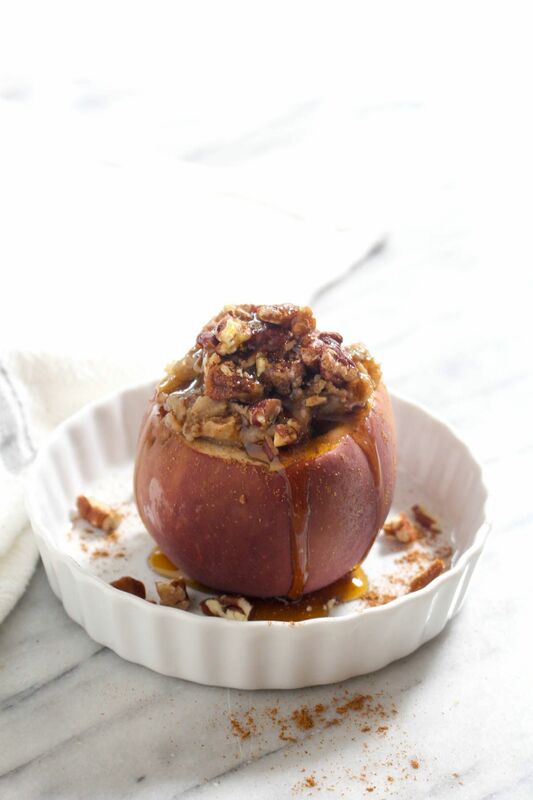 They are naturally sweetened, contain a serving of fruit, whole grains, and healthy fats from the pecans. They even have protein, thanks again to the pecans, and the oats as well. Tip #1: Cook it dry. For the oatmeal filling to set-up during baking, you really have to cook the oatmeal on the stovetop until it has absorbed all the water. When you think its done, take it off the heat and let it sit for a few minutes. If any water rises to the top, return to the heat and cook until absorbed. Tip #2: Apple cider takes the cake. This recipe calls for apple cider because it is the end-all-be-all in the liquid apple kingdom. 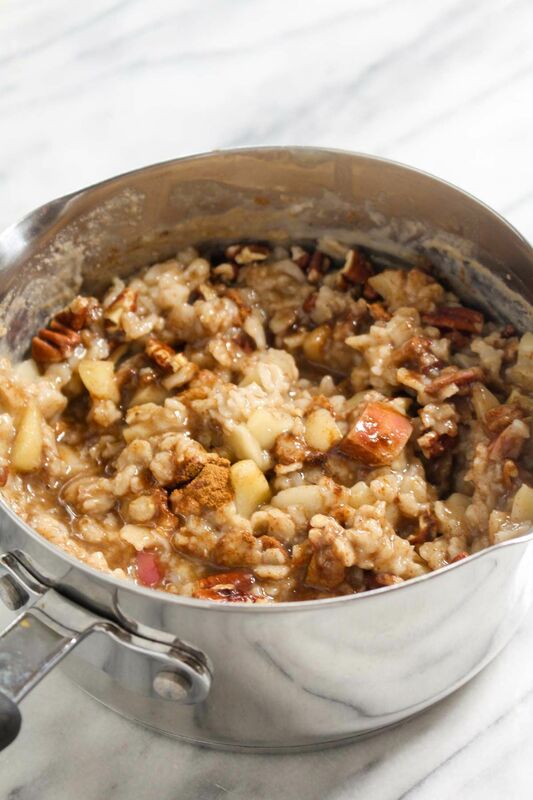 Apple juice has little flavor in comparison to fresh cider, which infuses the oatmeal with an intense apple flavor. If you can’t find fresh cider at a local farmers market, try and find some at your neighborhood grocery store. If all else fails, you can use apple juice, but cider will produce the best results. Tip #3: Apples come in all sizes. The oatmeal filling should fill about 4 medium apples. With that being said, apples come in a wide variety of sizes. 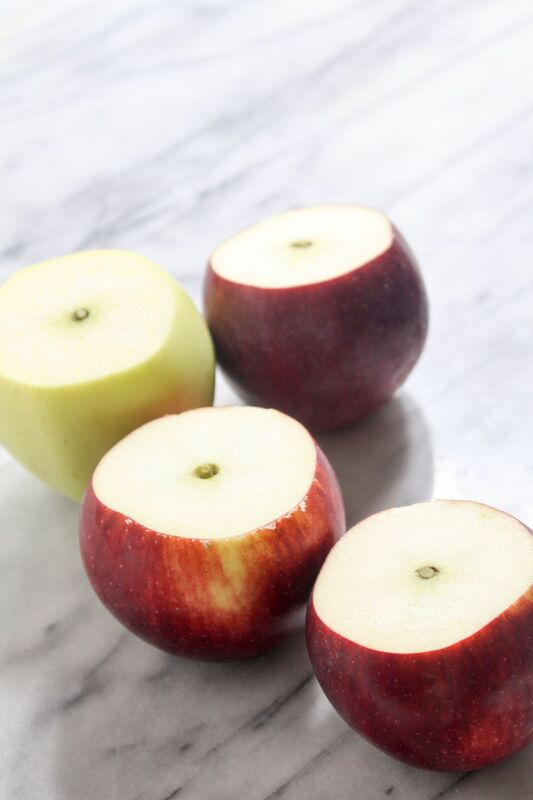 If your apples still have some extra room after filling, no harm, they will still taste delicious. 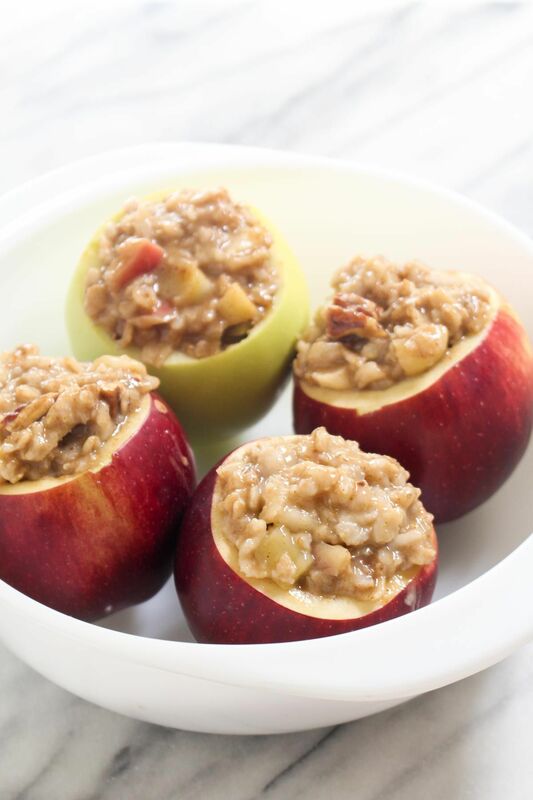 If you happen to have extra oatmeal after they are filled, you can serve it alongside your finished apples or you can save it for tomorrow’s breakfast. 1. Preheat the oven to 350 degrees. Cut the top off of each apple. 2. 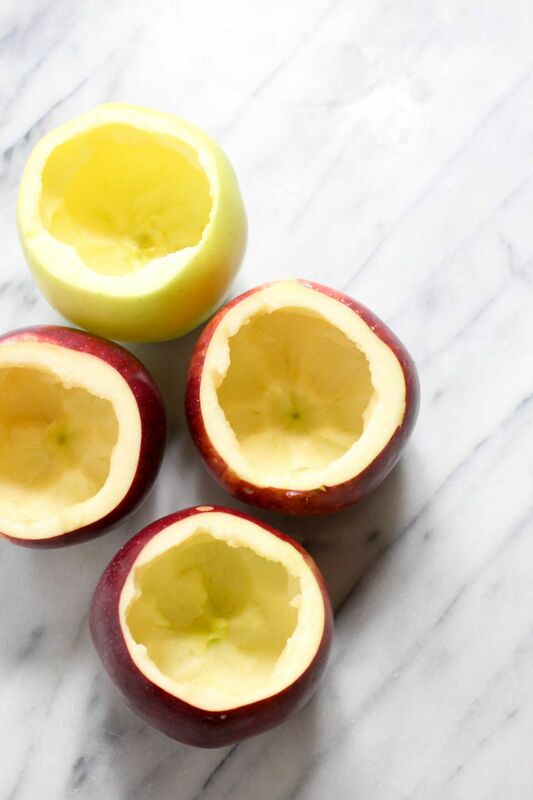 Using a melon baller or a knife, remove the inside of the apples. Reserve the insides and chop up the pieces that do not contain the core or seeds. Reserve 1 cup of the chopped apples. 3. Bring the almond milk, cider, and salt to a boil in a saucepan. 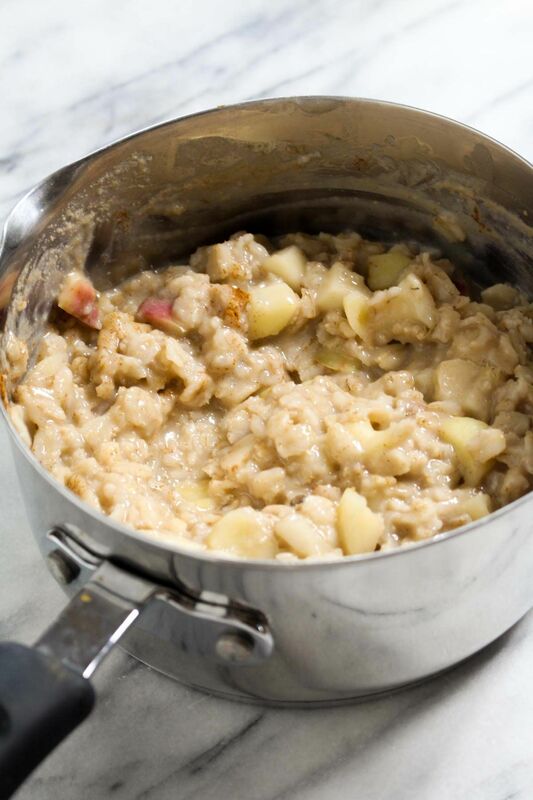 Add in the apple pieces and oats and cook until tender, about 10 minutes. 4. Add in the maple syrup, vanilla extract, half of the pecans, cinnamon, ginger, and spices. 5. Ladle the oats into the apples. 5. Top with the remaining pecans. 6. Bake for 40 minutes or until the apples are tender. Serve with additional maple syrup.